﻿ Fun Easy English - Travel the United States of America - Michigan. Learn before you travel. This section of Fun Easy English focuses on facts and other cool stuff about your favorite U.S. state. This is great English reading practice. This page focuses on the state of Michigan. 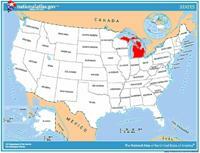 Michigan was the 26th state, admitted into the Union in 1837. Called the "Great Lakes State" because its shores touch four of the five Great Lakes, Michigan gets its name from an Ojibwa (Chippewa) Indian word meaning "large lake." Michigan has an unusual geography, as it consists of two land masses--the Upper Peninsula and the mitten-shaped Lower Peninsula. Detroit, its largest city, is known worldwide as the center of the American auto industry. 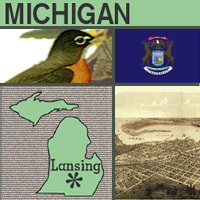 The apple blossom is the state flower, the robin is the state bird and Lansing is the capital. Michigan's official flag was adopted by the state Legislature in 1911 with a simple description: The State Flag shall be blue charged with the arms of the State (the state coat of arms appears on both sides of the flag, and also on Michigan's state seal). Animal symbols: Moose and Elk represent Michigan, the bald eagle signifies the United States. E Pluribus Unum: From Many, One (our nation was made from many states). uebor: I Will Defend (refers to the frontier position of Michigan). Si Quaeris Peninsulam Amoenam, Circumspice: If you seek a pleasant peninsula, look about you (also Michigan's state motto). Michigan's first flag was flown in 1837 (the year Michigan became a state). It featured the the state coat of arms, a soldier, and a lady on one side; and a portrait of Stevens T. Mason (the first governor) on the reverse side. In following years (previous to the official flag being designated) numerous designs were used with the coat of arms, including the United States coat of arms on the reverse. Travel and tourism site for Michigan - This state travel and territorial tourism site provides ideas for your vacations, meetings, and more. Have you ever heard of someone taking a bath while riding down a street? That's what the owner of the cruiser "Splish-Splash" does every year in the Woodward Dream Cruise. But that's only one of the cars that take part in this midsummer classic -- the world's largest one-day festival of the car culture. This auto parade, which stretches 16 miles on Woodward Avenue, running northwest from Detroit to Pontiac, Michigan, features classic cars, hot rods, antique and unique cars, and celebrates Woodward Avenue's contribution to American car history. Woodward Avenue is one of America's best-known cruising roads. Beginning in the 1950s, on summer nights along the Woodward "strip," the area swelled with teens and young adults cruising in their Fords, Chevys and Valiants. Sometimes called the "Boulevard of Dreams," Woodward Avenue has a history that goes back to 1896, when a car was first driven down the avenue. A few months later, Henry Ford followed in his new automobile. On August 4, 1924, Woodward made history again when it became the first concrete paved highway in the world, creating a primary link between Detroit and Michigan. Today, more than 30,000 cars and 1.5 million people join in this celebration of America's love affair with the car. How can a piece of art create a monster? Easy, it can inspire an entire city to hold a huge arts festival. It happened in Grand Rapids, Michigan, when a gigantic piece of sculpture was installed on a downtown plaza. In 1969, a type of stationary abstract sculpture, called a stabile (pronounced stay-beal), was installed downtown in front of City Hall. Twentieth century American artist Alexander Calder created it. Calder's stabiles are constructed of flat curving shapes of metal welded together and usually painted red or black. His stabiles are playful, fanciful creations that look great in parks and plazas. Once the sculpture was in place, the people of Grand Rapids started thinking that they needed an arts festival to celebrate Calder's work. More important, they needed an arts festival to celebrate the arts in West Michigan. So, in 1970, Festival was born. This three-day arts celebration, held the first full weekend in June in downtown Grand Rapids, attracts thousands of participating artists. Festival has grown from a few booths and food stalls into the nation's largest all-volunteer arts festival, with more than 20,000 volunteers and more than 500,000 people attending. It has grown so large that it is spread out over almost all of downtown - that's a monster of a festival! Auto manufacturer Henry Ford was a man ahead of his time. Although he didn't invent the automobile, Ford believed that a car that everyday people could afford would be a huge success. He was right and the company he started still exists today. But Ford was also ahead of his time in another way. He could have collected the finest and most expensive art in the world. But instead he collected commonplace things, like toasters, farm machinery, kerosene lamps, and steam engines. Ford felt that these everyday objects told a truth not written about in history books. Today, educators call these items "primary sources." In order to display his collections, Ford founded the Henry Ford Museum and Greenfield Village (originally called the Edison Institute, in honor of his friend, Thomas Edison), the world's largest indoor-outdoor history museum. Ford wanted his museum to be a place where people could see how their ancestors lived and worked. The 13-acre museum and village celebrates the accomplishments of American innovators, such as Ford himself, Thomas Edison, the Wright brothers, George Washington Carver, Noah Webster, and others. There's a world record for just about any contest you can think of -- even cherry-pit spitting! The Cherry Pit Spit began in 1974, when Herb Teichman, a Michigan cherry farmer, was looking for "something to do" with cherry pits. Growing from a neighborhood get-together to an international competition, the Cherry Pit Spit is recognized by the Guinness Book of World Records as an official competition. "Pellet Gun" Krause is the 10-time winner of the International Cherry Pit Spitting Championship. Each July hundreds of people from across the country and around the world gather for the Championship. The contest marks the beginning of the harvest of tart cherries in southwest Michigan. Until 1993, Rick "Pellet Gun" Krause of Arizona held the world record with a spit of 72 feet, 7 inches. Believe it or not, that's more than 25 feet less than the current world record. The world record is now 100 feet, 4 inches and is held by "Pellet Gun" Krause's son,"Young Gun" Krause. How far you do you think you could spit a pit? Where is Hitsville USA? It's in Motown, which is short for "Motor Town," which is a nickname for Detroit, the Motor City and home of the U.S. auto industry. Motown also happens to be the name of one of the best-known recording labels in the world. During the 1960s, Motown artists like the Supremes, the Temptations, Marvin Gaye, and Smokey Robinson and the Miracles dominated the pop charts. Visitors to the Motown Historical Museum in Detroit, Michigan, experience some of the excitement of Motown's early years. The original location of the Motown Record Corporation in Hitsville USA is a restored site that traces the story of the company's growth from its modest beginnings to the world's largest independent record manufacturer. Barry Gordy is the father of Motown. In 1959, he purchased a two-family flat in Detroit, and christened it "Hitsville USA." He lived upstairs and operated what became known as the Motown Record Corporation downstairs. Recordings were made in a former photography studio attached to the house. The birthplace of the famous Motown sound began in the reception lobby, where young hopefuls such as the Supremes and the Temptations waited to audition. The next time you hear a song like "Stop! In the Name of Love" or "My Girl," think about how the Motown sound has influenced today's music. As the numbers of farms in America disappear, barns are disappearing as well -- and with them a big part of American history. Even though the number of working farms is declining, Michigan is still one of the nation's leading agricultural states. Corn is Michigan's major field crop, but the state is best known for its fruit production. Michigan leads the nation in the production of cherries, and is a major producer of apples. The state is also usually the leading producer of dry beans in the United States. Christmas trees are another important agricultural product, and Michigan forests produce large quantities of pulpwood products. Because of all this agricultural activity in Michigan the 4-H Club there did a lot of work studying the architecture of barns. Using a guidebook developed at Michigan State University Museum, 4-H clubs photographed and cataloged the barns and silos of their counties. The club members not only preserved an aspect of their agricultural heritage that is now disappearing, but also they gained a greater awareness and appreciation of their past. Do you know why Detroit is known as "Motor City?" Long recognized as the historic heart of the American automotive industry, Detroit took on the nickname "Motor City." The state's automotive industry provided the model for mass production that other industries later adopted. Henry Ford pioneered the use of the assembly line in manufacturing automobiles. Using conveyor belts, factory workers put different parts together quickly and relatively inexpensively -- like a mechanical puzzle. Ford's Model-T was the first car produced in this fashion, and it could be assembled more quickly and consistently than had ever been possible before. Do you know why? Each person who works on an assembly line is responsible for doing the same job on each car. For example, someone might be responsible only for attaching the rearview mirror. This person would do the task so many times that he or she would become an expert at it and be able to do it very quickly. The following is a description of national forests and parks in the state of Michigan. There are no national monuments in this state. If you plan to visit or live in Michigan for awhile then you should definitely plan to visit some of these fantastic places. Located in Michigan's Upper Peninsula, Hiawatha National Forest borders Lake Superior, Lake Michigan, and Lake Huron. The forest is home to Grand Island National Recreation Area and five wilderness areas. Loda Lake National Wildflower Sanctuary is located around a small spring-fed lake in the forest. The Nordhouse Dunes Wilderness has sand dunes up to 140 ft (43 m) high along Lake Michigan. Located in the Upper Peninsula of Michigan, Ottawa National Forest stretches from Lake Superior to the Wisconsin border. There are 500 named lakes, nearly 2,000 mi (3,200 km) of streams, and three wilderness areas in the forest. The largest island in Lake Superior is a place of isolation and wilderness. Along with its many shipwrecks, waterways, and hiking trails, the park also includes over 400 smaller islands within 4.5 miles (7.2 km) of its shores. There are only 20 mammal species on the entire island, though the relationship between its wolf and moose populations is especially unique.